You may love dogs but what if your house is flooded with cute puppies? We are pretty sure about if you love dogs, you are going to love the pups more than that! They are too way adorable and a great source of joy! If there is a Pit Bull Dog in your home, you have a great opportunity to get the experience of having a large number of puppies from it. Do you know how many puppies can a pitbull have? Have you any idea about the breeding of a Pit Bull? If not, then the ongoing article is going to be worth reading for you. 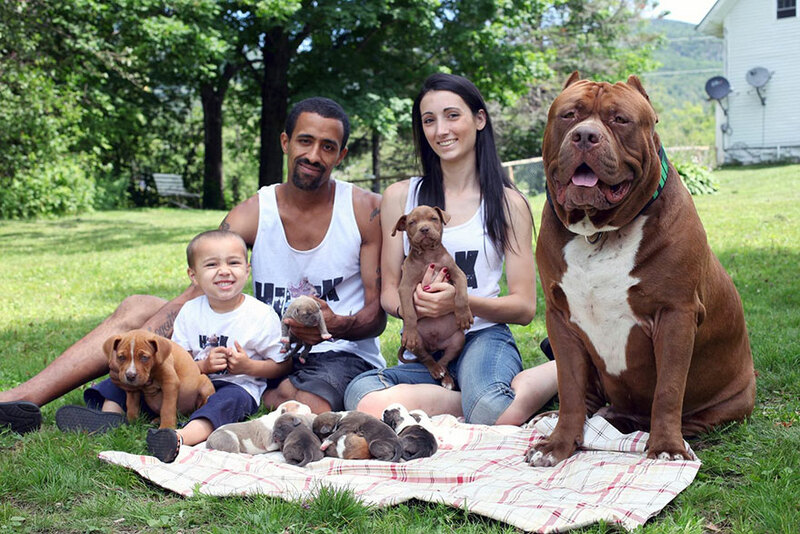 How Many Litters Can A Pitbull Have In A Year? How Many Puppies Can A Pitbull Have In Every Litter? Do you think the Pit Bull be a single breed/type of dog? If, then make a correction to your idea as the Pit Bull is a given name of certain types/breeds of dogs having some similar features. More specifically, Pit Bull is the general name for the dog type that is created by breeding two well-known type dogs ‘Bulldogs’ and ‘Terriers’ together. The newly produced breed comes with the strength of Bulldog and agility & gameness of Terrier. Most of the mixed-breed dogs that have a physical resemblance with these two main breeds are often called as Pit Bull Dog. Theoretically, a female Pit Bull can have a maximum of 3 litters in a year, but it's not possible always. In most cases, she is supposed to have 2 litters per year. Due to the cycle difference in every litter, you can see a pit bull is having 3 litters in a year, which may happen once in a few years. Pit Bulls used to come into heat for litter for the first time at the age of 6 months, although we recommend not to have a litter of puppies until it reaches to an age of 2 years at least. At the same time, we advise refraining from any breeding after 5 years of its age, although it can still have litters. We said in the previous para that a pit bull used to have 2 litters in a year. Now the most important question is How Many Puppies Can A Pitbull Have in each litter? It’s not possible to get an exact answer (accurate number of puppies) to this question. Actually, it varies. The first litter of a pit bull is the smallest one and it produces 2 to 5 puppies. The later litters produce a larger number of pups ranging from 7 to 10 puppies. The diet of your pit bull before and after her pregnancy may affect the size of the litter. The number of puppies may be reduced depending on dogs’ health, age, and other issues. You can head to a vet when you ask the question how many puppies can a pitbull have. The veterinarian meets with you when you make a maternity appointment for your dog, and they can use an ultrasound machine to see how many puppies are in the litter. The vet cannot always count the number of puppies correctly, but they give you a good idea of many puppies might be in the litter. You must make extra space for your pet where they can rest. Pregnant dogs need room to move around, and they must be comforted as much as possible. Your dog needs that same room for their puppies, and you can host the litter after the birth. You might want to ask for a house call when you have several puppies. Even if your dog only has three puppies, you might not want to keep them all. You could plan to give away some of these dogs to better homes, but they need to grow up a little bit first. The extra space you made the pregnant pitbull can be used for raising the puppies. It is highly important to make the trimming session calm and comfortable for your dog. So, you need to talk to him in a calm and quiet voice. The vet you use must be on your speed dial, and they answer your questions when you have issues with the dogs. They might have time to come to the house, or they can assuage your fears when you get them on the phone. Do not be afraid to call because your adult dog will be worn out, could get sick, and has to deal with a lot of puppies. Bottle feeding puppies are possible if some of them will not eat. You see this happen in zoos all the time, and you can do the same if some of the puppies are too small or sickly. Plan a feeding schedule for the puppies, get a formula prescribed by your vet, and feed them the recommended amount. You should also sit with him a few minutes in a day. If you gently rub his feet and legs, he will become more comfortable. You should start clipping nails only when your dog in a comfortable stage. You can provide him treats as rewards for making him calm. You have to watch the puppies very carefully for a few months before they can be given away. The process includes regular visits to the vet, feeding the smallest puppies, and keeping them in a safe place. The same goes for your adult dog because she might need her own brand of medical care. Extra house calls from the vet could be necessary. You could be wondering how many puppies can a pitbull have or how many puppies can a dog have but you must speak to your vet instead of guess. The vet can make house calls, give your dog an ultrasound, help you feed the smallest puppies, and provide medical care to assure everyone's safety.